The Outagamie County Nutrition Program offers CONGREGATE and HOME DELIVERED MEAL SERVICE to individuals 60 years and older or eligible disabled persons on a donation basis. The mealsite is held at the Hortonville Opera House, 312 W Main Street, Monday - Friday at 11:30 am - 1:00 pm. Please reserve your meal by calling 920-740-4648 24 hours in advance. See the Notices page for the Request for Bids and the project specifications. The Village has started to videotape the Village Board meetings. You can see them on YouTube by following this link. You must click on video. File of Life pouches are available at no cost at the Hortonville Municipal Services Center, or ask a Hortonville Police Officer, or call ADRC at 866-739-2372. The File of Life provides your medical information in a pouch on your refrigerator for use by emergency responders. You place a sticker near the entrance to your home to alert emergency responders to the presence of the File of Life. In a medical emergency the File of Life provides valuable information to help emergency responders in your treatment. The Village has added an ordinance authorizing prairie grass plantings as well as other non-traditional forms of yard plantings. See the Notices page (use the Notices tab on the left side of this page) for information on what you can have for a managed natural landscape! CLASSES, CLINICS, AND EVENTS - SEE THE EVENTS PAGE FOR INFORMATION! It is illegal for NON-VILLAGE RESIDENTS to leave or discard any article or items (including yard waste), or allow any article or item under his or her control, to be deposited at the Village of Hortonville's yard waste drop-off site. If any NON-VILLAGE RESIDENT is caught depositing anything at the Village of Hortonville yard waste site, they will receive a fine and/or summons. The Village of Hortonville may dispose of the waste material itself at the expense of that person found illegally disposing of the waste. PENALTY. Any person who shall violate the above provision shall be subject to a penalty as provided in Sec. 9.17 of the Hortonville Municipal Code. Come and help celebrate any senior citizen's birthday on the third Monday of each month! NEED INFORMATION ABOUT THE VILLAGE? Click here to see our data/info sheets and get your questions answered. Come meet the Village of Hortonville and find out why we are a great place to call home for your business or residence. We have recently greatly reduced our building permit fees and we are looking to help you fulfill your dreams of home or business ownership. Come learn more about us. We are the Village of Hortonville. Click here to see a two-minute video about Hortonville. Residents and business owners - Watch the video, tell others you know about it, and let's get people excited about the possibilities abounding here in Hortonville! The Village of Hortonville currently has openings for a communications facility lease on our water tower at 521 W. Cedar St. The site includes an existing fully powered and air-conditioned communication shelter building, and associated conduits running to the base of the water tower. Site availability date: April 3, 2014. BUILDING PERMIT FEE REDUCTION FOR 2016 through 2020! The Village has reduced single-family, two-family, and multi-family residential building permit fees through the end of 2020. Now is the time to build in Hortonville! All fees include the municipal water and sewer connection fees. 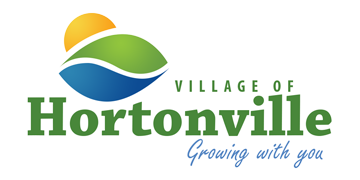 The Village of Hortonville lost a great number of trees along Main Street, in our parks, and at many private residences during the storm on August 7, 2013. The Village's Tree Board worked with tree experts to develop a plan for the replanting of our urban forest and the re-beautification of our home town. The tree replacement program was started in the spring of 2014. We would like to remind everyone about the Memorial Tree Program. Please contact the Administration office at 779-6011 for more information. See news and info about Village events and questions, Senior activities, coming events, Fox West Chamber news, and more. Click on the link for the Village Voice in the list at the left of the screen to read the Village Voice. Some residents have received a mailing recently offering water line insurance. This insurance is offered by private insurance companies and is not offered or sponsored by the Village of Hortonville. Insurance of this type is not mandated for your water lines. This program provides the opportunity to donate a park bench or tree in the memory of a loved one. Your donation to this program will not only provide lasting memories, but also help to beautify our parks and trails. Click here to see the informational flyer. The Veterans Memorial has really moved along! The concrete walk is in and the memorial has been installed. One stone bench has been purchased and will be installed. You can purchase an engraved brick to honor your veterans or make a donation for the memorial or a bench. Just click on Forms, Permits, Licenses in the left margin to be able to download a copy of the purchase form.